A new product for a new requirement-The Hard drive shredder, nowadays there is less papers and more data on computers, the data core â€“ HARD DRIVE has to be destroyed completely before disposal. A hard drive shredder can completely break the hard drive into pieces, to ensure total security, physical destruction of hard drives and other electronic data-bearing media is the most effective and desirable solution. 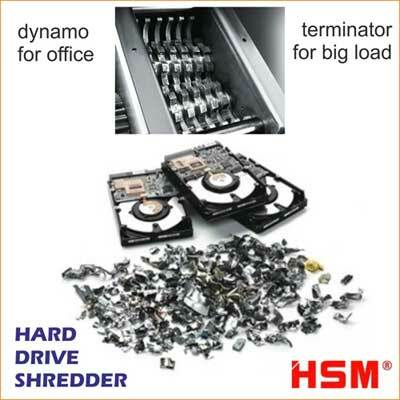 SASCO offers Hard Drive Shredder from HSM (Germany) destroys not only standard-size hard drives (up to 1â€� thick), but also server drives, as well as mobile phones, PDAs, smart phones, and electronic storage devices, cassettes, floppies and CDs too. The total destruction of these unwanted optical data storage devices not only relieves any worry about security risks, but adds a reliable income stream for your business in the form of a service. HSM Hard Drive Shredders are compact powerhouses silent yet power full--these machines offer impressive performance with minimal noise and vibration. Mounted on wheels for easy mobility, they can also be installed in a truck for mobile on-site destruction. Shreds: Hard Drives and Magnetic Tapes up to 3.5'' (DLT, Ultrium, LTOs), Zip, Optical Media (CDs/DVDs, Blu-ray), Credit and Identity Cards, USB Sticks, Solid State, Phones and PDA's. Degausser and shredder combos are also available at very reasonable prices. Please also see our hard drive destroyer for an economical table top office solution.